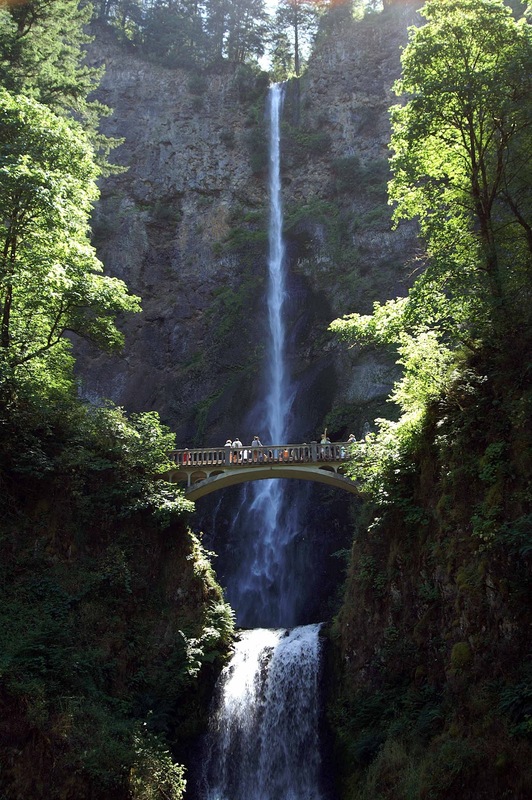 In a one week period I was able to go birding in two diverse habitats, the Oregon Coast and Southeast Arizona. I saw around 200 different bird species. Added 21 life birds in two states I have previously birded. Many birds we saw were soul satisfying views of birds I had seen only once previously. Met a few life birders (birders I had never met previously). And had the most awesome time doing it! For the Oregon trip, I did a ton of preparing and studying up on the birds that I had hoped to see. 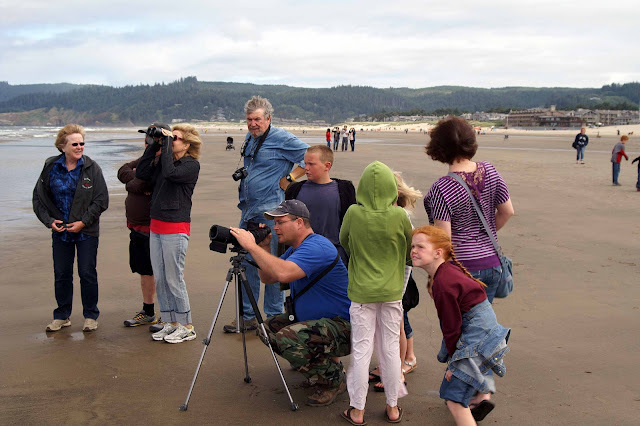 Because of the dynamics of the family reunion, I didn't really do any specific birding trips in Oregon, I just enjoyed the birds wherever we went and my family was kind enough to humor me frequently. This method netted me ten life birds. I didn't do any planning for the Arizona trip as I knew that the folks from Swarovski Optik would show us a good time and I figured I would see whatever we would see and had no expectations of life birds...but I saw eleven lifers during a day and half of intense non-stop birding in some spectacular birding hot spots. My dSLR camera was left with the Mrs., so most of my images were taken with my iPhone and some were digiscoped through a Swarovski ATX spotting scope. Other photos are by my father, Kent Mortensen. Please indulge me in this travelogue - afterall, it's my birthday. Yes, I was born the very day that Elvis died. So, if you belive in reincarnation, well...the King still lives and I am the King of Rock n' Roll. 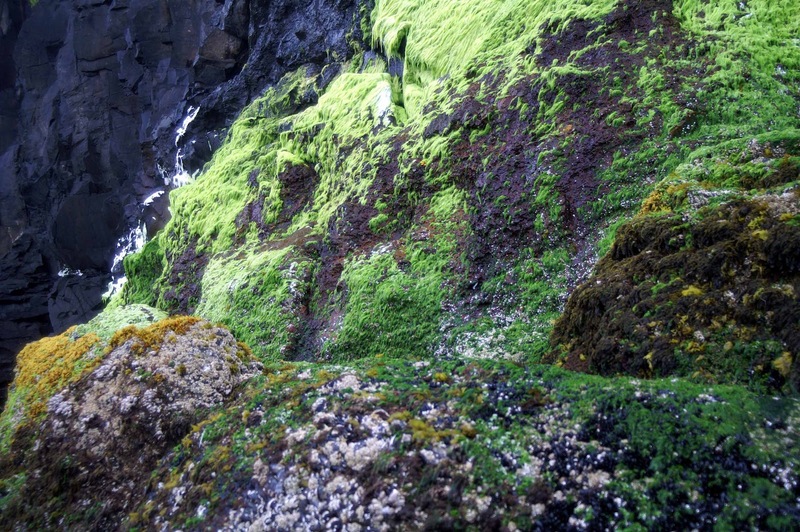 Shades of green on the rocks at Cape Lookout beach. Multnomah Falls, near Portland, Oregon. Site where I added my first life bird of the trip, Chestnut-backed Chickadee. When we got to our camp at Cape Lookout State Park, these chickadees were super abundant. A view from Cape Meares, Oregon. 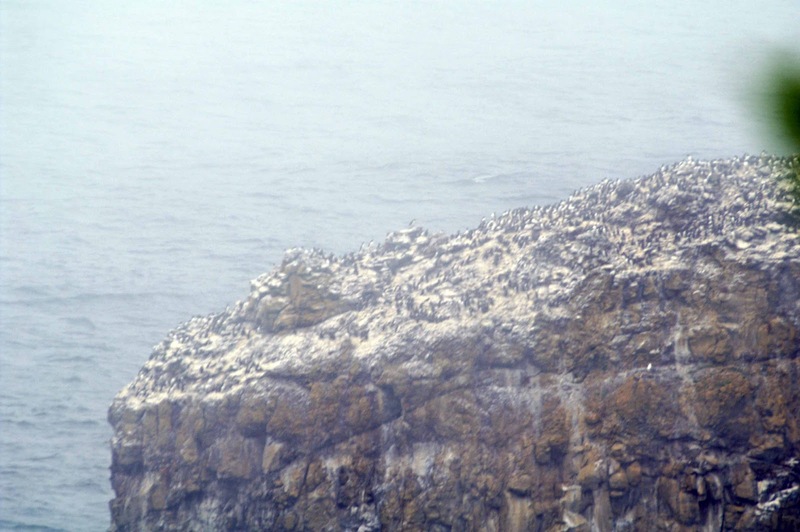 Here I saw my life Common Murres, Black Oystercatchers and Pigeon Guillemots when we could see through the fog out over the rock. 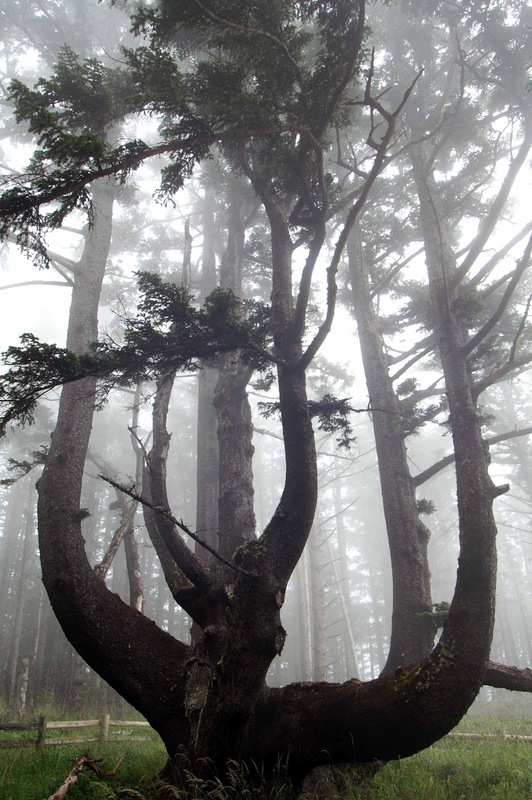 The misty woods at Cape Meares. Gorgeous! 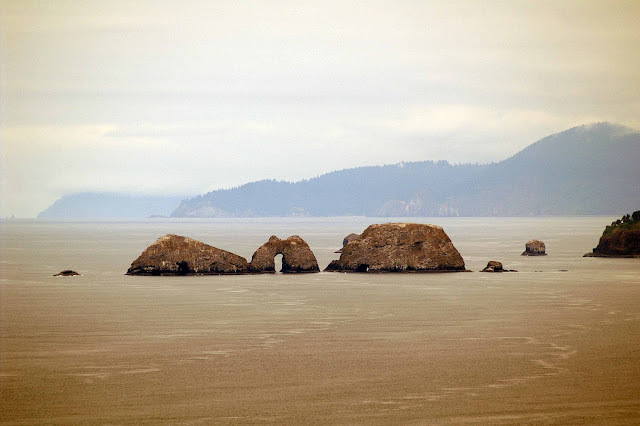 For those of my generation who grew up watching the movie The Goonies, do you recognize this place? The Goondocks in Astoria, Oregon. This home is being lived in, so no tours. Just a look-and-see. 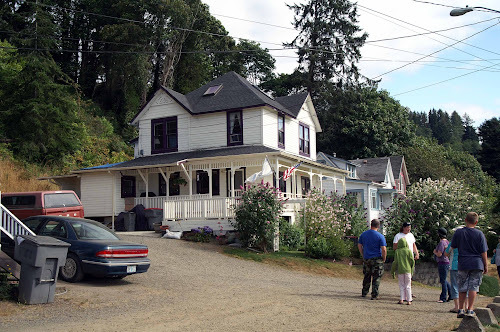 The Goonies must have save the house from demolition after all! The top of Haystack Rock at Canon Beach, Oregon. The site of my first ever sighting of several Tufted Puffins. 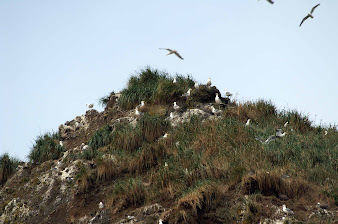 Below are members of my family and other passersby checking out the puffins too. Now that is a spark bird if ever there was one! Maybe someone in my family will fledge as a birder...just maybe. Hey, I take my Pledge to Fledge seriously folks! 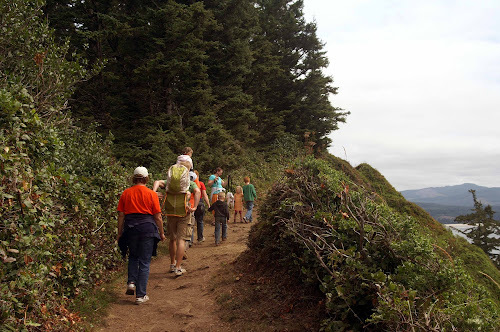 The entire family hiked out to the end of Cape Lookout. We saw whales blowing out in the distance and I added Wrentit to my life list. My non-birding brother was able to see his first Varied Thrush, which also pretty cool. Swarovski Optik brought a group of bird-bloggers together to talk about blogging and social media for most of a day. The discussions were so fascinating and entertaining. I really enjoyed it and got a lot out of it. I sure hope Swarovski got something out of it. In the photo above you can see the back of Nate Swick's head of the ABA Blog/The Drinking Bird blog, Mike Bergin of 10,000 Birds, Sharon Stiteler the "BirdChick", Carolina, Dean, and Clay of Swarovski Optik, Rue Mapp of Outdoor Afro, Jim Cirigliano of Bird Watcher's Digest, and Laura Kammermeier who blogs, writes, and markets all things birding. Birding Mt. Lemmon, AZ. Clay Taylor of Swarovski Optik and Jim Cirigliano, managing editor of Bird Watcher's Digest in the foreground. Laura Kammermeier and her husband in the background. View looking north from Mt. Lemmon, Arizon. There were Yellow-eyed Juncos everywhere. Hermit Warblers and Hermit Thrushes. So many cool birds! Mike Bergin from 10,000 Birds just before we saw a Band-tailed Pigeon and a Zone-tailed Hawk. Sharon teaching Rue about the total awesomeness of iPhone digiscoping with Swarovski scopes. Clay Taylor in the background. Jim C of BWD and Laura Kammermeier, and again Clay Taylor in the background stalking something to digiscope along the trail in Fort Huachuca Canyon. Mexican Spotted-Owl in Miller Canyon. Life bird! Sherri Williamson and her husband Tom Wood of SABO spend the entire day with us showing us great birds and so much more. Here we are at Beatty's in Miller Canyon where fires had ravaged the previous year. Nature's recoveries are actually quite thrilling. Young Elegant Trogon. Shortly after this photo was taken we saw the brilliantly colored father bring in a large hairy caterpillar and feed the young bird. Photo below by Sharon Stiteler. So freakin' cool to see! We saw and heard at least five different trogons, which is pretty epic in my book. Special thanks to Swarovski Optik North America for the trip to Arizona. Additional thanks and kudos to Sherri Williamson and Tom Wood of SABO for guiding us all day in the Huachuca Mountains and showing us a whole lot more outdoor goodness than birds. Not to mention the Beatty family in Miller Canyon and Mary Jo of Ash Canyon B&B. Wonderful people doing so much for birds and birders in that region. Finally, thanks to my wife, who supported me in bailing on the family reunion a day early to catch up with the bird bloggers in Arizona. What a blast! One of the highlights of the AZ trip for me was adding you to my life birder list. Looking forward to next time, wherever that is. So glad you had such fun and lifers in AZ. We have birded there many times in Aug., it's awesome. What a whirlwind week of birding! From the west coast to southeast AZ, you got one hotspot after another! Looks like you couldn't have had a better group either, it's like the birding A team down there. Thanks for the thrilling read Robert. Sounds like you had the best time of your life, Robert. I am so envious! But reading your report almost makes up for not being there in person! I am exaggerating of course, but your report and especially your photos are wonderful. How lucky you were to have such glorious birding adventures. Sounds like you had a wonderful time. 21 life birds is very exciting. Your enthusiasm shines through in this wonderful post! Fantastic photographs, too!